The overnight death—between February 28th and March 1st—occurred at the Salvation Army Centre of Hope emergency shelter, located in Abbotsford at 34081 Gladys Avenue. 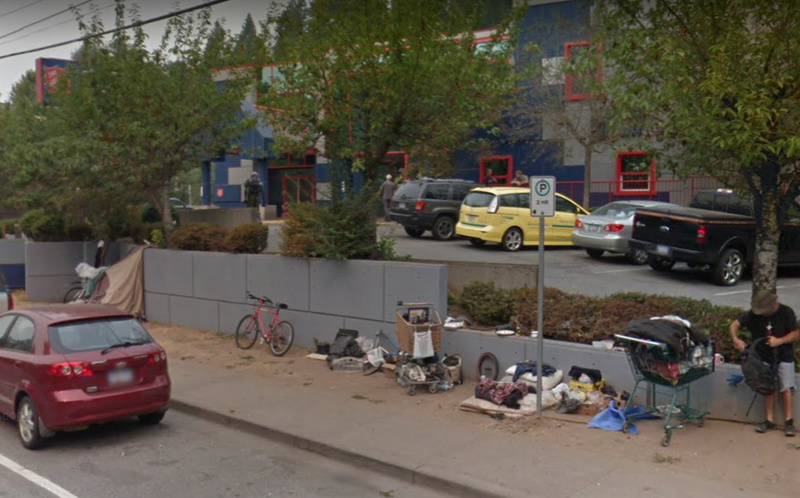 This marks at least the fifth or sixth death of a homeless person in Abbotsford in the last three years and the second death of a “street-embedded” person in about as many months. In December of 2018, according to The Abbotsford News, a formerly homeless man—housed in Abbotsford since 2017—died “suddenly and unexpectedly”, with the cause of death linked to alcohol abuse. In July of 2018 a homeless Abbotsford man in his 40s was struck and killed by a car on a stretch of Gladys Avenue near the Salvation Army. The man, who’s first name was Jesse, was a well-known occupant of a nearby homeless encampment. In October of 2017, an man in Abbotsford, who may have been homeless, died of overdose on the sidewalk in front of a business. In October of 2016, the body of The body of a “well-known” homeless man was found outside the Abbotsford city hall building. In March of 2016, a 57-year-old homeless man was found dead in an Abbotsford park, nearby to a homeless camp. Police quickly determined that the death was not suspicious. Of all the known homeless deaths in the province, between 2007 and 2015, recorded by the B.C. Coroner’s Service, only 8 occurred in Abbotsford, compared to 81 in Vancouver. However, since 2015, the reported death rate among homeless people appears to have dropped dramatically in Vancouver. The one death that, of course, comes to mind first is that of Ted—the elderly homeless man who passed away at a table in a Vancouver Tim Hortons in June of 2018. Otherwise, since 2015, I am only personally aware of three formerly homeless people who have died—all in social housing—either from overdoses or illness. Just as we can guess that the apparent decrease in homeless mortality in Vancouver is linked to a deliberately rapid increase of shelter and re-housing options, it’s hard not to think that homeless people in Abbotsford continue to die at such an unacceptable rate because Abbotsford has chosen not to be nearly so proactive. Abbotsford has not work with its partners, such as B.C. Housing, to create anywhere near the necessary number of shelter beds for its homeless population. The Fraser valley city’s most recent count of it homeless population was in spring of 2018 and found 233 residents living in the community without a home. At the time, Abbotsford homeless advocate Ward Draper, of the Five and Two Ministry, publicly estimated the real number was more like 400. All the same, on November 22nd, 2018, there were only enough shelter beds for—at best—40 percent of the 233 known homeless people. According to B.C. Housing’s online shelter map, there were a mere 95 emergency shelter beds available in Abbotsford. And only 80 of them were for all ages and all genders. Another 60 beds—mostly extreme weather response—were closed. Beyond not working to create sufficient emergency shelter beds, Abbotsford has been comparatively slow to approve re-housing options, such temporary modular housing (TMH). Abbotsford’s first units of TMH may be finally under construction now, with an expected completion date later this year, while Vancouver had nearly 200 units of TMH ready for occupancy over eight months ago. As a direct result of Abbotsford’s go-slow approach, very many of the city’s homeless residents have had no other option but to sleep outside as best they can. Sometimes, in Abbotsford, the cold wins and a homeless person loses. Click the image to enlarge it. Better late than never? 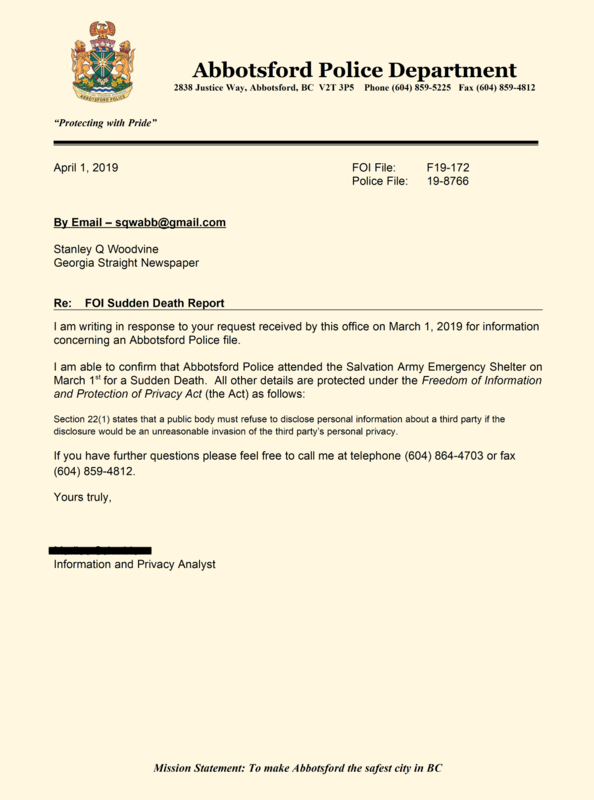 Response received April 1st from the Abbotsford Police Department to my March 1st request for information. Dear Mr. Woodvine, I am not on any of the social media you have listed to use for sharing. Are you okay with me copying pasting the link so I can share this on Facebook? Stay safe, Kathy. Stop whining about the homeless-they are well looked after in many places and DO die from OD’s of their drug habits. Most of us have worked and paid their taxes and dues to society but most homeless people come from back east due to milder weather and I am tired of supporting them-I am a senior who only gets a pension-not free drugs, housing or welfare. Give your head a shake and wake up and smell the coffee where things lie. Being homeless myself — and not have a drug habit, or collecting government assistance, as it were — I have to take umbrage with your heartless “me-first” attitude and spreading of misinformation. Every homeless count within the 22 municipalities of Metro Vancouver has demonstrated over-and-over that the vast majority of displaced persons living in the area were born in the community. Of course, Abbotsford is outside of Metro Vancouver and does not count its homeless population with anymore care than it shows their well being, so I cannot say what percentage of the city’s homeless are living where they were born. However, It strains credulity that they would have all escaped the cold and snow of Central Canada, only to settle for the snow and cold of the Fraser Valley. I’m happy that you are secure and receiving your pension. I know many elderly homeless in Vancouver who likewise worked hard and paid their taxes, only to end up living in broken down cars and vans — if they are lucky — and rough on the streets, if they are not. Squareonevillages.org People should find the time to explore this website! The answers are all there! This has been the nastiest February EVER!!!! How about this idea…… Anytime yer sittin’ and sh****g on a nice warm toilet (with a ROOF!!! ), with a show of empathy for the unhoused, whip out yer device, and explore THAT website, and the links, and all the success stories. We take SO MUCH for granted!!! I am sitting on my chair in front of my own computer in my warm house. Thank you for the link to Square One Villages. I will share it with the housing society in my community here on Vancouver Island.